Spin and Tennis String Movement Balls were fired at stringbeds of different materials and the outbound spin and string movement were measured. Which Strings Generate the Most Spin? In 2005, Yoshihiko Kawazoe and Kenji Okimoto performed an experiment measuring the spin rates of used, notched strings in both their natural condition and after applying a lubricant to the string intersections to facilitate tangential string movement.2, 3 They found that the lubricated notched strings produced 30% more spin than the unlubricated notched strings. 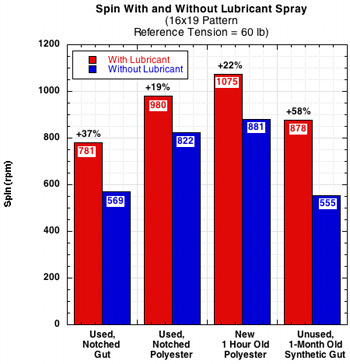 The following experiment extends their results, finding spin increases in the lubricated condition ranging from 14-58%, depending on string type and use condition. Five racquets all with 16 mains by 19 cross string patterns were tested. Each racquet had a different string and use condition, as detailed in Table 1. Table 1 — Strings used in the experiment. Lines were drawn with a felt-tip pen around the circumference of tennis balls in order to measure spin. Balls were fired at a nominal angle of 28 degrees from perpendicular to the stringbed using a ball machine with an indicated speed of 47 mph and "high spin." Due to variances in the actual launch mechanism, the angle was 28 +/- 1 degree, the speed was 49 +/- 1 mph (22 m/s +/- .447 m/s), and the spin was -3150 +/- 286 rpm (330 rad/s +/- 30 rad/s). Even though the variances in input parameters were small, they can be important. Spin varies more due to changes in incoming spin, speed and angle than it does due to changes in string properties. Therefore these variances have to be controlled for. This was done by normalizing the raw data. Normalization procedure is discussed in detail in the article "Which Strings Generate the Most Spin" under the heading of "Normalization Experiments." Suffice it to say that normalization allows us to calculate what the spin would have been had the impact occurred at exactly the desired incident angle (28 degrees), speed (47 mph), and spin (-3150 rpm). The impacts were filmed at 420 fps from the side, parallel to the trajectory of the ball. Twenty to fifty impacts of each setup were filmed with the best (in terms of orientation of the equatorial lines drawn on the ball and impact location on the strings) 12-15 measured and analyzed. This fairly large measuring sample was chosen to average out some of the large variances in spin that occur with all strings and setups, but especially the 16x10 30 lb. setup. The experimental setup is shown in Movie Screen 1. Movie Screen 1. Experimental Setup. 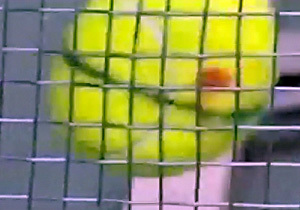 Balls fired by ball machine at a stationary but free-swinging racquet rotating about an axis 3.5 inches from the end of the racquet and about its longitudinal axis. Each racquet was tested first in its natural condition. The racquet was then removed from the apparatus and sprayed on both sides of the strings with the lubricant WD40. After a good coating had been applied, each cross and main string was moved back and forth by inserting a screwdriver in each pattern opening and pushing back and forth. This method ensured that all the intersections were coated with lubricant. The racquet was then remounted and tested. Because all racquets had different use histories and been subjected to different stresses, they were not all in equivalent condition when this test was performed. That was by design. The goal was to see whether string lubrication had any effect at all and, if so, was it a universal or a particular phenomenon? Also, the aim is not to compare different strings to each other, but only to compare each string to itself in the unlubricated and lubricated condition. WD-40 was chosen only because it was handy. It was not chosen to be a real world product to be applied to racquet strings. It is messy and wet, but it did the job required by the experiment. Furthermore, the aim of the experiment is not to promote any product as a strategic equipment customization for actual tennis play. String lubrication is currently legal for play by ITF rules, but there are probably drier and slipperier products available than the one used in this experiment. It should also be noted that any lubricant also can rub off onto the ball, clothing and court, to whatever effects may follow. It may also lessen the friction between the ball and the string. Figure 1 presents the spin data for the experiment. Figure 1 — Spin results for each string and setup in the non-lubricated and lubricated conditions. For the 16x19 pattern, the spin increased for every string — from 19–58%. Any adverse effects of a lesser ball-to-string coefficient of friction did not overcome the topspin facilitation due to lubrication. There is no pattern to the increase, whether by string type or use condition. Each string increased in spin as a function of its individual use and condition parameters. So we can't make any generalizations about what kind of percentage increases to expect by lubricating nylon, gut, or polyester as a class of materials compared to other classes. But it seems that we can say that in this type of high tension, dense pattern setup, each string type will experience a significant increase in spin. And further, the cause of the increase is due to greater lateral string movement by the mains and the resulting torque they create when they return to their original positions. Movie Screen 2 shows an unlubricated and lubricated used nylon string employed by Kawazoe and Okimoto in their experiment. This movie was not used to obtain data in the present experiment, but it is presented as a dramatic qualitative demonstration of the effect. Movie Screen 2 (courtesy of Yoshihiko Kawazoe [Saitama Institute of Technology, Saitama, Japan] and Kenji Okimoto [Sanai Ltd., Hiroshima Japan]). Videos were filmed at 10,000 frames per second for the experiments referenced above and were taken of actual forehand shots by a tennis player. The 16x10 pattern is a different story. Spin increased for the setup at 60 lb. (14%) but dramatically decreased for the 30-lb. setup (-90%). This is a dramatic demonstration of a phenomenon explained in the experiment "String Stiffness and Spin" — spin decreases with too much string movement. This occurs because the main strings are pushed forward in front of the ball's center of gravity ("normal force offset") and push upward, creating a counter-torque and decreasing topspin. This occurs when the stiffness/tension of the main string is too low and the inter-string friction low so that the string stretches and moves more (too much). By adding lubricant between strings, an already poor topspin setup becomes even worse. However, it is surprising how much difference the lubricant makes at 30 lb, given that you might think that there was very little friction to eliminate to begin with. This was a very sticky, high coefficient of friction string, even when the force pushing the strings together is low. Once this stickiness was neutralized, the strings literally moved "out of control." When the strings are pushed forward beyond a certain distance, the restoration force becomes more effective in slowing the ball parallel to the strings than it is in increasing spin. This happens because the displaced mains tend to create a ramp that pushes obliquely backward on the ball, causing it to rebound higher. This effect was most apparent when the normal force moves forward by more than 4-5 mm. Figure 2 shows the rebound angle for each of the strings. The ball impacts at 28 degrees above the horizontal. Most of the time, it rebounds below the horizontal. Rebounds in this direction are labeled positive in this experiment. Balls that rebound backward and above the horizontal are negative (i.e., the direction was reversed). So, in the graphs, the lower the rebound angle, the higher the launch angle. When the speed and angle of the swing is added to the rebound angle, the launch angles will be as is expected — trajectories over the net instead of into the ground. 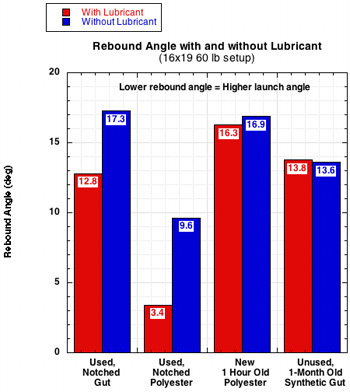 Figure 2 — Rebound Angle results for each string and setup in the non-lubricated and lubricated conditions. Angles listed are above (negative because ball reversed direction) and below (positive because ball continued forward motion) the horizontal. So, the greater the angle, the more the ball is headed downward, and the lesser the angle, the higher the ball is launched. Given five separate strings and use histories, it has been shown that lubricating a given, existing string setup (i.e., lowering the inter-string friction) will increase the topspin and, most of the time, the angle of rebound due to the greater tangential movement of the mains. The exception to this rule is that if the string stiffness/tension is too low, the strings will not snap-back with sufficient energy or quickly enough to increase spin. Instead, the strings are pushed forward and are still under the front of the ball when the ball rebounds. This creates both a counter-torque and an oblique, backward push. The consequence is less topspin and a higher launch angle. This experiment is not a case for lubricating strings. Rather it is a test to show that main strings that move laterally can, under most circumstances, produce more spin than those that do not move. It is an experiment to discover causes for the difference in spin production between strings. But it also shows that whatever you do to setup that helps main strings move will also increase spin, as long as the string stiffness/tension is high enough and does not move too much. 1 R. Cross, "Impact of a Ball on a Surface with Tangential Compliance", Am. J. Phys. 78, 716-720 (2010). 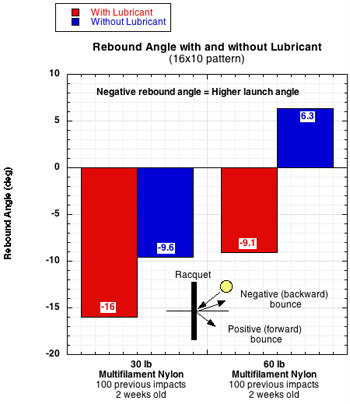 2 Y. Kawazoe, K. Okimoto, "Tennis Top Spin Comparison between New, Used, and Lubricated Used Strings by High Speed Video Analysis with Impact Simulation," Theoretical and Applied Mechanics Japan, 57, 511-522 (2008). 3 Y. Kawazoe, K. Okimoto, "Super High Speed Video Analysis of Tennis Top Spin and Its Performance Improvement By String Lubrication", The Impact of Technology on Sport (ed. A. Subic, S. Ujihashi), ASTA Publishing, 379-385 (2005). 1 "Which Strings Generate the Most Spin?" 2 "String Movement and Spin"
3 "String Snap-Back and Spin"
4 "Spin and String Pattern"
5 "Sliding Friction and Spin"
6 "Static Friction and Spin"
7 "String Stiffness and Spin"